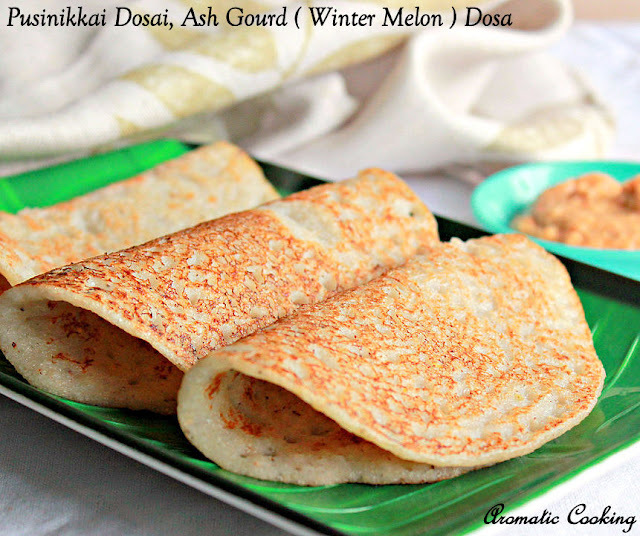 Today's post is going to be one more dosa, and this time I have used Vella Pusinikkai/ Ash Gourd or Winter Melon to make it. As I have said so many times, we love idlis and dosas at home, and this one again turned out to be really good. To make it a little more healthier, I have used idli rice and jowar ( solam ) in equal proportions. This is not an instant dosa, it needs previous soaking, grinding and then the batter has to be fermented. 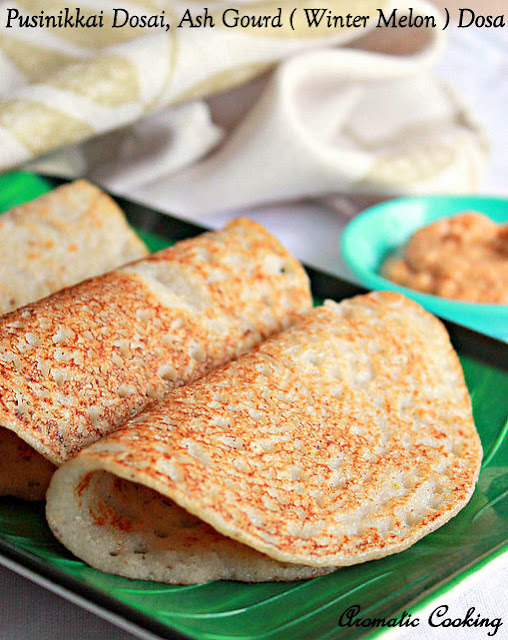 The dosas came out so soft and spongy like set dosas and they would go very well with coconut chutney, sambar or vada curry..
Wash and soak the rice, jowar, urad dal and fenugreek seeds overnight. Next day morning, grind it with the green chillies into a smooth batter. Make a puree with the ash gourd pieces ( about 1 cup ). Add the ash gourd puree to the ground batter along with the salt and mix everything together with your hand, cover and leave it to ferment for about 8 to 10 hours. Heat a dosa pan, pour a laddle of batter, spread it as thick or as thin as you want, drizzle some oil all around, cover and cook, till the bottom starts browning, flip and cook the other side and remove. I have used the mixie/blender for grinding, if making large quantity then you can use the grinder. I made thick and spongy dosas ( like set dosa ) with the batter, but you can make them thin and crispy too. 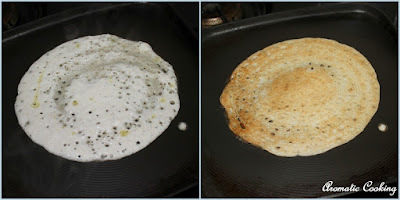 The holes that pop up when you pour the dosa batter on the pan, shows that the batter has fermented well, only then the dosas will turn out soft and spongy. When I say smooth batter, it doesn't mean powdery smooth, it'll still be a little grainy. After fermentation, the batter will not increase in volume like in the case of regular idli/dosa batter, but you'll still be able to see that it has fermented. Interesting recipe. Very healthy and tempting.Beautiful clicks! Innovative dosa recipe, sounds healthy and delicious. They look so beautifully golden brown and delicious, Hema. This is really healthy, i liked the colour of this dosa.